Callum Lynch spent years in care but managed to graduate from university yet he still worries about how he will cope in the future. The 22-year-old says people who have lived in care find it difficult to make the transition to the adult world and have no parental "fall-back net" if things start to go wrong. Callum's family background in Glasgow's east end was "violent and neglected", he says. It led to him being kicked out of two primary schools for disruptive, attention-seeking behaviour. He told BBC Scotland: "I just wanted someone to acknowledge that what was going on in my background was quite saddening. "It was easier to exclude me from primary school instead of acknowledging what the real issue was." When he was 11, Callum and his brother were taken into residential care. Here, natural sibling rivalry and bickering led to attempts to split them up and and send them to separate homes. 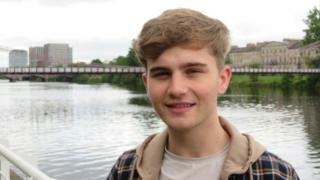 An advocate from Who Cares Scotland intervened and it didn't happen - but Callum believes it is a common problem. He says: "It's detrimental on mental health and can change the dynamic of a sibling relationship. "People end up even falling out of contact with their sibling because of the separation." Fearful of "becoming a statistic" of those who find themselves in care, Callum applied himself to his academic studies in high school. He eventually earned a scholarship on a Harvard education system, spending two months at the Ivy League college before returning to complete a degree at Strathclyde University. The 22-year-old will graduate from its business school in November. Callum should be one of the people under 26, who have been in care, who will qualify for council tax exemptions under new Scottish government plans. At least 21% of care leavers become homeless within five years, according to Scottish government statistics, while they are three times more likely to be unemployed than their peers. Callum believes the new government tax exemption will help those in similar situations but is just the first step in changing the outdated care system. He said: "It's absolutely phenomenal but its an incremental change and in order for there to be something really successful it needs to be quite a radical change to the care system. "Young people [in care] are eight times more likely to be dead by 25. "You are living in a care system where, I think there was a quote from Glasgow City Council that said they were giving emotional nurturing rather than love, but I don't think people would use that expression to their own children. "The system doesn't reflect the process of growing up in a normal family home at all. You're in an institution." While he has managed to successfully navigate many of the troubles that young people leaving care face, he admits that he struggles with mental health issues. "I'm not going to lie to you, the transition is really difficult," he says. "With all that I've achieved, I've still got terrible mental health, and 45% of kids who leave care have diagnosed mental health conditions. "We don't have a fall-back net. If I can't afford to pay my rent this month, I'm going to end up in homeless accommodation or on the street. "If one of my peers couldn't pay their rent and moved out, they'd move back in with their mum or something but I don't have that luxury unfortunately." While for many coming out of care, there is not enough emotional support, he argued. "I've graduated from Strathclyde University and worked hard to put myself in this position but there's thousands of kids who are leaving care in debt and underprepared mentally, emotionally and financially. "These are kids who are leaving care at 16 and being placed into flats with no narrative or structure of how their life could go. "They've never had parents there to help them or show them the ropes. "It's about being placed into something supportive and nurturing in the first place. "We can help them by teaching them to budget, but I think we need to put them in a setting which is more nurturing as opposed to systematic. That's what's going to make the real difference here."